An energy-efficient transportation system requires accessible, affordable, and low-energy-intensity travel options for all users. With the advent of mobile computing and growing awareness of the benefits of active (non-motorized) transportation, alternatives to solo driving are finding wide appeal, especially in urban areas. Yet vehicle miles traveled (VMT) in the United States are projected to grow 18% by 2050, overwhelming our already overburdened road network while impeding reductions in total transportation energy use and emissions. 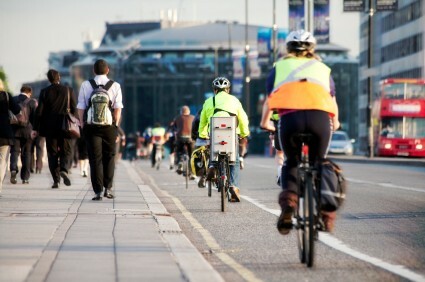 An efficient and sustainable transportation system requires coordinating transportation and land use planning, and building mobility choices in a way that is equitable and consistent with meeting energy and greenhouse gas goals. ACEEE promotes measures to increase transportation system efficiency. We analyze potential energy savings of strategies to reduce the need to drive and track federal, state, and local progress on transportation efficiency policies. We also develop tools to assess energy savings from transportation measures. Information and Communications Technologies in Personal Travel– ACEEE estimates near-term and long-term energy efficiency potential from technology-enabled transportation sector strategies such as real-time transit information, carsharing, and bikesharing. City Energy Efficiency Scorecard – ACEEE’s City Scorecard scores the largest U.S. cities on a range of energy efficiency policy metrics. The transportation section highlights city best practices to improve system efficiency through zoning, integrated transportation and land use planning, and transit investments, as well as to promote advanced vehicle technology adoption. State Energy Efficiency Scorecard –The State Energy Efficiency Scorecard ranks all 50 states and the District of Columbia on their energy efficiency efforts. The transportation chapter evaluates whether states have dedicated transit funds, smart growth laws or incentives, and complete streets policies, among other policies to promote system efficiency. Local Energy Efficiency Policy Calculator (LEEP-C) – The Local Energy Efficiency Policy Calculator is a tool for local policymakers and stakeholders interested in advancing the adoption of transportation and buildings energy efficiency measures in their communities. Travel Efficiency Toolkit – This toolkit provides information on policies that increase transportation choices, reduce automobile trips, and decrease energy consumption. The toolkit provides guidance for local and regional officials involved in land use and transportation planning in addition to state transportation and utility offices that work regularly on transportation efficiency programs.